1. The Corps of Engineers has inherent fiduciary responsibilities to insure existing projects continue to provide economic benefit, do not harm the environment and are technically sound throughout the project life. They do not need a Federal Judge to order a correction but can do so as an independent action. 2. The dams have a Benefit to Cost ratio of 15¢ on the dollar (.15 to 1) in terms of National Economic Development, the standard by which the Corps must measure economic benefit. 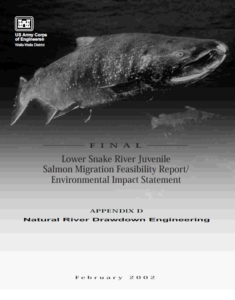 Corrected Cost and Economic conclusions based on Corps data and planning processes show breaching via channel bypass has benefits ranging from 4 to 20 to 1 with Regional effects adding more than 5K jobs in E. Washington and Lewiston. 3. #1 and #2 are why the Corps can put the projects into a “non-operational” status. This does not change the project Purpose thus does not need Congressional Authorization. breaching and is consistent with recent court rulings. requiring only the simplest of design and contracting; essentially a Time and Materials contract for renting bulldozers and loaders to notch the dam for hydraulic removal and placement of armor stone, if required. Time to contract award is a matter of a few weeks and easily within the Contracting expertise of the Corps. required by the 1980 Power Planning and Conservation Act, ratepayer funds, not new Congressional Appropriations, can be used to pay for the breach costs. Under the Fish Mitigation clauses of the 1980 act, BPA could pay the full cost of breaching and could receive a credit on their Federal Debt for the dams should they choose to. They could do this as the most cost effective fish mitigation measure in the Columbia/Snake. System and to avoid loosing more money on generating power at a loss on the 4 dams. 7. The Lower Snake Navigation system was out of service four months this year with no noticeable effect on farm shipments. Grain shipments continue to shift to truck/rail to Portland and SeaTac or truck/rail/barge to Columbia river ports using Washington States grain shuttle service because it is cheaper than the using LSR Navigation. 8. Oversupply and balancing power already exist to take up loss of LSRD generation. Conclusion, all relevant ethical, policy, financial, technical or biological reasons to support a Dec 2018 start of breaching are in place now. To not do so will waste additional $millions and prevent salmon/orca recovery.